Quick Ship Item: ships same day if ordered by 2:00 PM PST Monday-Friday. Quick Ship Item: ships same day if ordered by 2:00 PM PST Monday-Friday. Also available for store pickup. Shipping weight 37 lbs, carton size 10" x 10" x 23"
Not only is the Sunkist Commercial Juicer a real time saver, it is pretty to look at as well. Its gleaming housing is chrome-plated steel, and the dome, spout and bowl support are made of a strong corrosion-proof white plastic. Extremely safe to use, the J1 is listed by Underwriters Laboratories, NSF International, Canadian Standards Association, CE (Europe), and VDE (Germany). 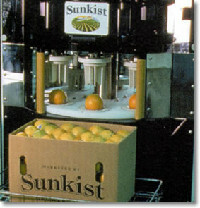 Orders for the Sunkist J-1 Juicer ship same day if ordered by 2:00 PM PST Monday-Friday. 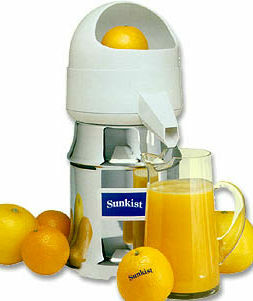 Flat Rate UPS Ground shipping to the continental United States on Sunkist Juicer model SUNKIST J-1 is $39.95. Pick this item up at our California store or warehouse and pay no shipping. Orders can be placed by phone (877-386-7766), secure order form, or online shopping cart. Identify your part from the Parts Diagram shown below, or the archived parts diagram. Orders may be placed by phone (877-386-7766), online shopping cart, or using our secure order form. Commonly ordered parts may be ordered below. 1 Plastic Bowl Assembly. 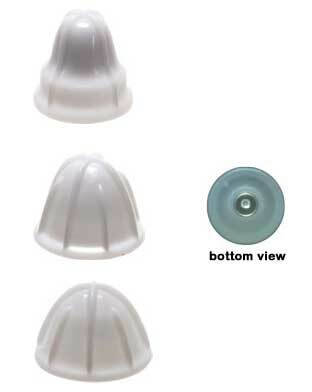 Includes dome (10A), spout (10B) & bowl support (10). 2A Lemon/Lime fits #7 & #8 models: Depending on Serial Number. Please verify visually before ordering. 2B Orange fits #7 & #8 models: Depending on Serial Number. Please verify visually before ordering. 2C Grapefruit fits #7 & #8 models: Depending on Serial Number. Please verify visually before ordering. 3M Three Bulb Set: Lemon/Lime, Orange, Grapefruit fits #7 & #8 models: Depending on Serial Number. Please verify visually before ordering. The Sunkist Sectionizer is not just for citrus. You can save valuable hours in the kitchen using our machine to uniformly slice, wedge or halve a variety of fruits and vegetables. Easy to use. Easy To Clean. Completely Safe. Please contact us to purchase blade cups separately. The Sunkist Fresh Fruit Sectionizer for Apples is made of sturdy ABS plastic and weighs only 13 pounds. It is listed by NSF International. 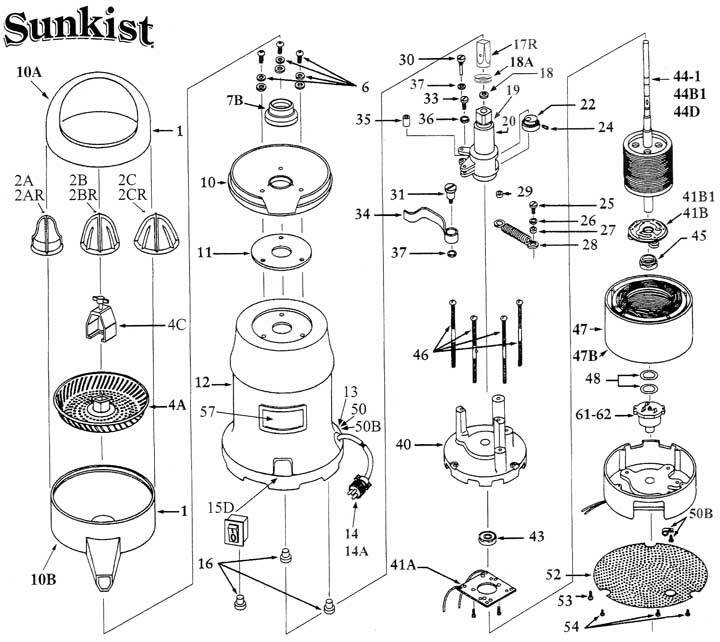 The Sunkist Auto-90® Sectionizer is an automated version of the very popular tabletop Sectionizer. It uses the same blade cups and plungers and can sectionize up to 90 pieces of fruit per minute. When you purchase a Sunkist Auto-90® you have your choice of one set of eight of the following blade cups with the corresponding plungers. 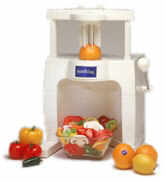 In addition to sectionizing citrus fruit, you can use this machine to core and wedge apples and pears. It will also slice firm tomatoes and mushrooms for sandwiches and pizzas or wedge them for salads. The Auto-90® can slice and/or wedge hardboiled eggs, kiwi fruit, small to medium potatoes, strawberries; just about any firm (not hard) fruit or vegetable without pits that will fit through the blade cup. Like our tabletop model, cleanup is a breeze - simply hose down the stainless steel interior with water or steam and throw the blade cups and plungers in the dishwasher for effortless sanitizing. This machine is about the size of a refrigerator measuring 35 inches wide, 52 inches long and 77 inches tall. It is powered by 208-240 AC, single phase 5 amps. Certification is provided by Intertek® Testing Services (ITS). This item is warranted to be free from defects of workmanship and material under normal use and service for a period of one year from the date of installation.